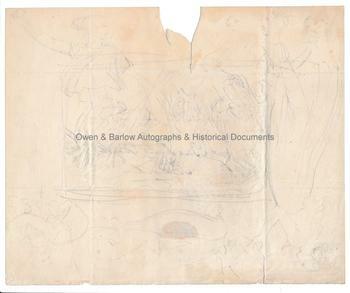 SIR MARTIN ARCHER-SHEE and WILLIAM ETTY Autograph Letter Cover Signed by Archer-Shee with Drawing on Verso probably by Etty. Martin Archer-Shee, British artist and President of the Royal Academy. William Etty, British artist noted for his classical nudes. 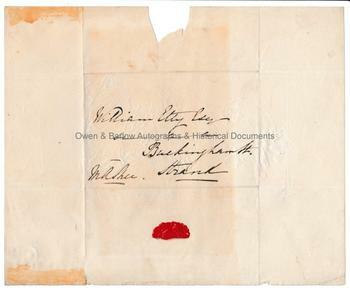 Autograph Letter Cover in the hand of and signed by Martin Archer-Shee addressed to William Etty, Buckingham Street, Strand. On the verso of the cover is a sketch of Grecian female figures in various poses with a central square that appears to show a rough composition for a picture. Not dated but circa 1830. 22.5 x 18.5 cms (9 x 7.5 inches). Slight glue stains to left flap of the cover, else near fine. The sketch, which is similar in style to some of Etty's work is presumably by him rather than Archer-Shee, as Sir Martin is unlikely to have used one of his own rough sketches to enclose his letter to Etty. The sketch also avoids the area affected by the cutting of the wax seal when opened, which suggests that it was executed after receipt and opening of the letter, not before. An interesting item. William Etty moved to his apartment in Buckingham Street in 1824 and had been voted a full member of the Royal Academy in 1828. Martin Archer-Shee became President of the Academy in 1830.